At Mutual Security our goal is to help our members achieve financial security. That's why we're providing members who have a credit card with us free access to their FICO® Score. FICO® Scores are calculated from many different pieces of credit data in your credit report. This data is grouped into five categories as outlined: Payment History, Outstanding Debt, Credit History Length, Pursuit of New Credit, and Credit Mix. 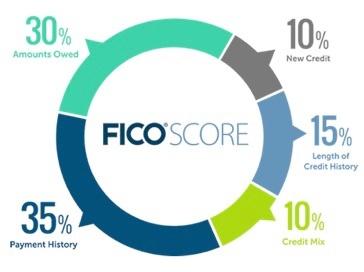 The percentages in the chart reflect how important each of the categories is in determining how FICO® Scores are calculated. FICO is a registered trademark of Fair Isaac Corporation in the United States and other countries. MSCU and Fair Isaac are not credit repair organizations as defined under federal and state law, including the Credit Repair Organizations Act. MSCU and Fair Isaac do not provide "credit repair" services or advice or assistance regarding "rebuilding" or "improving" your credit record, credit history or credit rating.